The first commemorative USSR stamps were issued on August 9, 1923, replacing the postage stamps of the Russian Soviet Federated Socialist Republic (RSFSR). The year 1923 was a time of great celebration. A new nation had been born, run by the representatives of the working-class people, instead of the landed nobility, aristocrats, and the political elite. Yet there would soon be a period of great sadness and mourning, as the founder of the new nation, being only 53 years of age, would pass away from a lengthy illness. 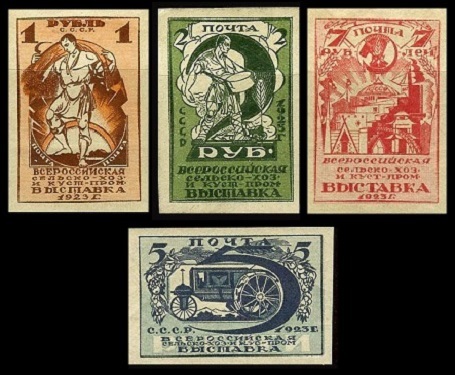 The four commemorative USSR stamps shown above were issued on August 19, 1923 to celebrate the First Agriculture and Craftsmanship Exhibition of the USSR, held in Moscow. 01 R. - Allegory of Reaping. 02 R. - Allegory of Sowing. 05 R. - Fordson Tractor. Manufactured by Henry Ford & Son, Inc. and then Ford Motor Co. between 1917 and 1964. Between 1921 and 1927, the RSFSR and the USSR imported over 25,000 of the Fordson Model-F Tractors. 07 R. - Allegory of the Exhibition. 01 R. (1923 - Sc. #242) - Brown & Orange. 02 R. (1923 - Sc. #243) - Deep Green & Pale Green. 05 R. (1923 - Sc. #244) - Deep Blue & Pale Blue. 07 R. (1923 - Sc. #245) - Rose & Pink. 01 R. (1923 - Sc. #246a) - Brown & Orange. 02 R. (1923 - Sc. #247) - Deep Green & Pale Green. 05 R. (1923 - Sc. #248) - Deep Blue & Pale Blue. 07 R. (1923 - Sc. #249a) - Rose & Pink. 01 R. (1923 - Sc. #246) - Brown & Orange. 05 R. (1923 - Sc. #248a) - Deep Blue & Pale Blue. 07 R. (1923 - Sc. #249) - Rose & Pink. 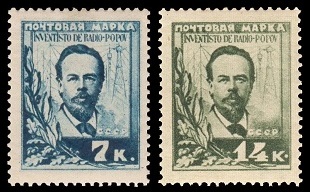 The four commemorative USSR stamps shown above were issued during early 1924 in mourning for the untimely Death of Vladimir Lenin. The common design features a facing portrait of Lenin. 03 K. (1924 - Sc. #265) - Red & Black. 06 K. (1924 - Sc. #266) - Red & Black. 12 K. (1924 - Sc. #267) - Red & Black. 20 K. (1924 - Sc. #268) - Red & Black. 03 K. (1924 - Sc. #269) - Red & Black. 06 K. (1924 - Sc. #270) - Red & Black. 12 K. (1924 - Sc. #271) - Red & Black. 20 K. (1924 - Sc. #272) - Red & Black. 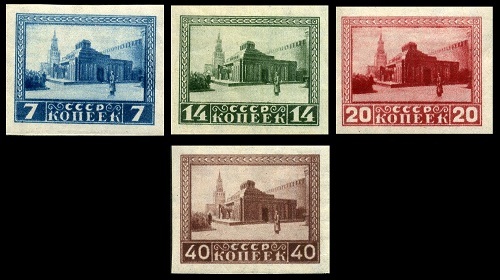 There were three printings of these USSR stamps, with each differing in the size of the red frame. Forgeries also exist! Vladimir Ilyich Ulyanov, called Lenin (1870-1924) was a Russian communist revolutionary, politician, and political theorist, and he is widely regarded as one of the most significant political leaders of the 20th Century. Lenin was the head of government for both the RSFSR (1918-1924) and the USSR (1922-1924). He lived to see his dream of a socialist nation come true, but between the middle of 1921 and the beginning of 1924, he had become gravely ill.
Lenin continued working, as long as he could, but on January 21, 1924, he lapsed into a coma at his Gorki home and died. A later autopsy on his brain revealed that he had died from severe sclerosis. 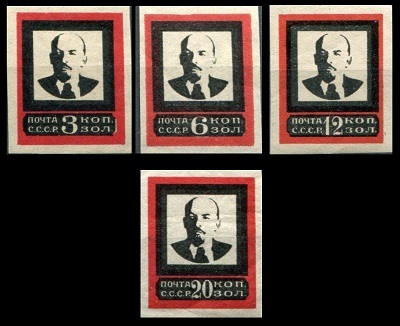 The four USSR stamps shown above were issued in January 1925 to commemorate the First Anniversary of Lenin's Death. The stamps are photogravure printed on paper with WMK 170. The common design features Lenin's Mausoleum in Red Square. Following Lenin's death, his body was mummified and placed on display in his mausoleum, where it remains to this day. 07 K. (1925 - Sc. #294) - Deep Blue. 14 K. (1925 - Sc. #295) - Dark Green. 20 K. (1925 - Sc. #296) - Carmine Rose. 40 K. (1925 - Sc. #297) - Red Brown. 07 K. (1925 - Sc. #298) - Deep Blue. 14 K. (1925 - Sc. #299) - Dark Green. 20 K. (1925 - Sc. #300) - Carmine Rose. 40 K. (1925 - Sc. #301) - Red Brown. The two commemorative USSR stamps shown above were issued in September 1925 to commemorate the 200th Anniversary of the Academy of Sciences. The stamps are photogravure, printed on paper with WMK 170, and they are perforated 12 1/2, 13 1/2, and compound. The common design features Mikhail V. Lomonosov and the Academy of Sciences. 03 K. (1925 - Sc. #326) - Orange Brown. 15 K. (1925 - Sc. #327) - Dark Olive Green. Mikhail V. Lomonosov (1711-1765) was a scientist and writer who made important contributions to literature, education, and science. One of his most important discoveries was the atmosphere of Venus. His specialty subjects included natural science, physics, chemistry, mineralogy, history, and art. The Russian Academy of Sciences, with headquarters in Moscow, was founded in 1724, and its scientific institutes are located all across the Russian Federation. It currently includes 500 institutions and 55,000 scientific researchers. The two commemorative USSR stamps shown above were issued in October 1925 to honor Alexander S. Popov. The stamps are photogravure, printed on paper with WMK 170, and they are perforated 13 1/2. The common design features a portrait of Alexander Popov (1859-1905), the Russian physicist who is acclaimed in his homeland and in Eastern Europe as being the inventor of Radio. 07 K. (1925 - Sc. #328) - Deep Blue. 14 K. (1925 - Sc. #329) - Green. 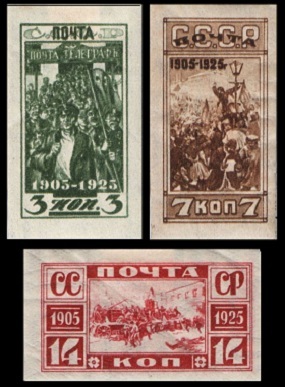 The three commemorative USSR stamps shown above were issued on December 28, 1925 to celebrate the 100th Anniversary of the Decembrist Uprising. 03 K. - Decembrist Exiles. 07 K. - Street Rioting in St. Petersburg. 14 K. - Revolutionist Leaders. 03 K. (1925 - Sc. #330) - Olive Green. 07 K. (1925 - Sc. #331) - Brown. 14 K. (1925 - Sc. #332) - Carmine Lake. 03 K. (1925 - Sc. #333) - Olive Green. 07 K. (1925 - Sc. #334) - Brown. 14 K. (1925 - Sc. #335) - Carmine Lake. 03 K. (1925 - Sc. #333a) - Olive Green. The Decembrist Uprising took place on December 26, 1825. Russian Army officers and about 3,000 soldiers participated in a protest against Czar Nicholas I accession to the throne. The uprising was quickly suppressed. The three commemorative USSR stamps shown above were issued on December 20, 1925 to celebrate the 20th Anniversary of the Revolution of 1905. 03 K. - Revolutionaries Parading. 07 K. - Revolutionary Haranguing a Mob. 14 K. - Street Barricade in Moscow. 03 K. (1925 - Sc. #336) - Olive Green. 07 K. (1925 - Sc. #337) - Brown. 14 K. (1925 - Sc. #338) - Carmine Lake. 03 K. (1925 - Sc. #339) - Olive Green. 07 K. (1925 - Sc. #340) - Brown. 14 K. (1925 - Sc. #341) - Carmine Lake. 03 K. (1925 - Sc. #339a) - Olive Green. 07 K. (1925 - Sc. #340a) - Brown. 14 K. (1925 - Sc. #341a) - Carmine Lake. The Revolution of 1905 was a wave of political and social unrest through large areas of the Russian Empire. It lasted from January 1905 through June 1907. The revolution actually led to government reform, including the establishment of the State Duma, the multi-party system, and the Russian Constitution of 1906.